If you'd like different color, please take a look on the last picture for more colors available. Please let me know the color you'd like on "message to seller" when you check out the item. This halter is very beautiful and comfortable. Perfect for summer wear, night wear, beach wear, or as a bikini top with jeans or shorts. Please select your US size & bra cup when ordering. Note we "may" request measurements on certain selected size & bracup combinations to be certain of a proper fit. Enter these in the "Note to Vikni" comment section on the order form or reply asap after purchase. 1) Bust (around your body over the fullest portion of your Bust)=? 2) Under Bustline (around your body just Under your Bust)=? 3) Waist (around your body just above the navel (belly button)=? If you don't have a sewing tape measure, use some type of string and note the length around then measure the string on a yard stick, ruler or a metal tape measure. If you'd like a different color please note the last item detail photo color chart (on items that offer it). Enter your color preference in the "Note to Vikni" comment section on the order form or reply asap after purchase. (We may be temporarily out of a specific color on occasion, we will contact you if this is the case if not inquired as to availability prior to ordering. Contact us prior to ordering if you require specific availability. For best results, hand wash in cold water and squeeze excess water after rinsing (do not wring) then lay flat on a dry towel to air-dry. Please feel free to contact me on Etsy conversation. Have a different style in mind? I have many more beautiful Halters and items all handmade by Vikni! 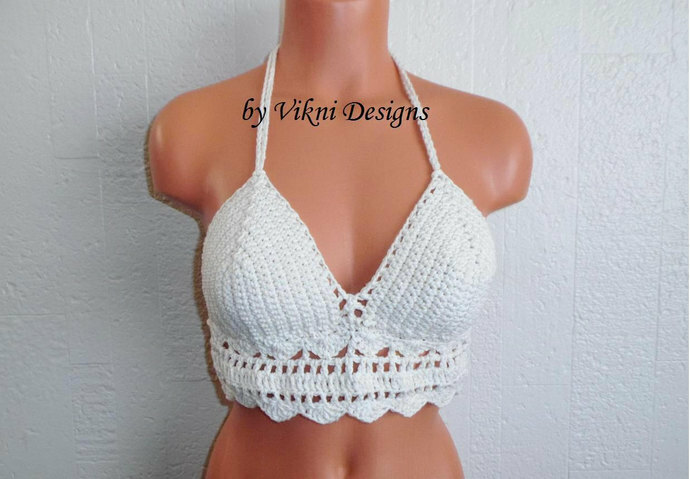 Thank you for shopping Vikni Crochet Designs.